When your parents, grandparents, or great-grandparents told you how they met or about their journey to America from the Old Country, they told you a story like Brooklyn. A deeply felt romantic drama, the film is at once simplistic yet emotionally complicated as it delves into questions about how we characterize “home”. Is home the place where we were born and raised, or is our sense of home ever-changing, leading to the adage, “Home is where the heart is”? If the latter is true, certainly there’s some question about where the heart of Brooklyn‘s protagonist lies. From the celebrated novel by Colm Toibin, director John Crowley (Boy A) and screenwriter Nick Hornby (An Education, Wild) comes a classically told story about an Irish immigrant in the United States. She’s torn between her country of origin and her new dwelling in New York, and the two men who represent her respective homes. 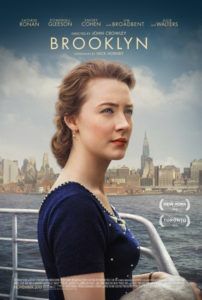 Brooklyn transports the audience to its 1950s surroundings, when social mores were different and a certain decorum expected in both Ireland and the titular borough. Another world far removed from today’s cynical culture, the relatively small neighborhoods represented by Crowley and Hornby seem isolated and quaint. No less are they nostalgic and endearing in their representation, complete with adorning physical and visual details. Francois Seguin’s gorgeous period production design and Odil Dicks-Mireaux’s elegant costume design are further enhanced by the rather distinguished, superbly lighted photography. 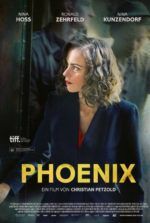 Though only a few scenes were shot in New York, Yves Belanger’s cinematography makes excellent use of Ireland and Montréal’s older architecture in support of the film’s entirely convincing settings. And every scene is improved by Michael Brook’s lyrical scoring. In a way timeless but also bound to a specific historical period, the story revolves around Eilis Lacey (Saoirse Ronan, her character’s name pronounced “A-lish”), a twentysomething young woman who finds her opportunities limited in her home of Enniscorthy, County Wexford, in southeast Ireland. There she lives with her mother (Jane Brennan) and older sister Rose (Fiona Glascott), adhering to the strict and quaint rituals of small-town Ireland. But the church has arranged for Eilis to travel to Brooklyn, home of many Irish immigrants of the period, securing her a room in a brownstone under a prickly landlady (Julie Walters); she also receives an education in accounting and a job at a posh department store, all arranged by a genial local priest (Jim Broadbent). 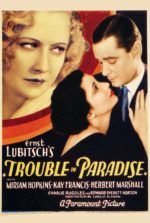 Though fraught with seasickness on the journey there, she’s overcome by homesickness once she arrives, a malady that passes once she meets Tony Fiorello (Emory Cohen), a well-mannered and endearing boy from a local Italian family, and begins to find everything about America much easier thanks to the happiness he brings her. 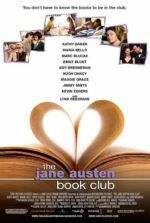 Her ensuing, measured romance with Tony is interrupted when she’s called back to Ireland for a family emergency. Rose has inexplicably died, leaving Eilis to regret ever leaving Ireland and missing her sister’s funeral. She returns into the charmingly familiar rhythms of her hometown, with more than a little help from her mother, friends, and old acquaintances who seem determined to orchestrate her prolonged stay. Roped into helping a local business with their bookkeeping, she’s given further reason to remain in Ireland by the most promising eligible bachelor around, Jim Farrell (Domhnall Gleeson), an attractive and charming fella with prospects galore. Above all, going back to Brooklyn would mean sentencing her mother to a life of solitude, since Rose is gone now. But Ireland also has a lot of customs and traditions for young women that now feel backward by comparison. Caught between two notions of home, Eilis guides a deceptively simple narrative into an exceptionally beautiful and romantic story. Her decision is a complicated and brave one, filled with mixed emotions and the unrelenting pull of memory and nostalgia. If one had to pick a singular reason to see Brooklyn, it’s Ronan’s performance. She conjures a wide array of expressions in Eilis and avoids turning her into a melodramatic character. She’s reserved, but underneath that reservation resides subtle cues and carefully registered signs of her interior emotions that make Ronan’s quietly powerful performance one of the most affecting, complex portrayals of 2015. Once a burgeoning adolescent talent with an uncannily mature presence (see Atonement or Byzantium), Ronan has now grown into a young woman of exceptional talent, whereas many child performers sometimes do not make that transition as gracefully. She’s joined by an exceptional supporting cast, including Gleeson, Broadbent, Walters, and especially the newcomer Cohen. Brooklyn doesn’t offer shocks or innovative storytelling. It’s not meant as a new take on an old tale. This is classical filmmaking at its finest, transporting the audience to another time and place to flawlessly recreate the emotional context of Irish immigrants in this setting. While other films—The Godfather: Part II (1974) or Charlie Chaplin’s The Immigrant (1917)—have considered the immigrant experience, none have done so with such a complete picture of how the idea of “home” becomes a transitory concept. Tender and unassuming, Brooklyn proves relatable regardless of the viewer’s personal experience. Immigration could be a metaphor for younger people leaving home to attend college and make a life for themselves, or moving to a new city for a job. Wonderfully crafted and unendingly moving, Brooklyn is a poignant romance about carving out a life and making a home for yourself, something to which we can all relate.